CONICET researcher describes the advantages of having Argentine satellites. Arsat 2. Photo: courtesy INVAP. 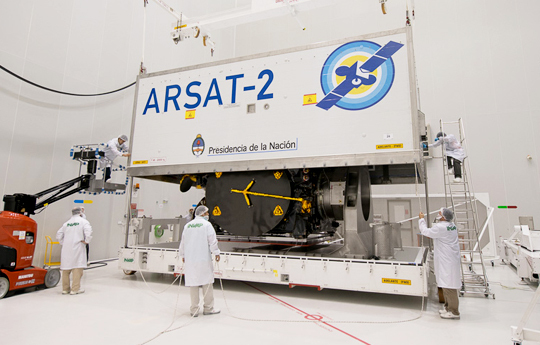 From the French Guiana, the second of the three Argentine ARSAT satellites is going to be launched today. It will improve significantly the telecommunications services the Argentine State provides to the population and private companies. These geostationary satellites do not revolve around the Earth, they do it at a fixed point instead as they have a fixed orbit. 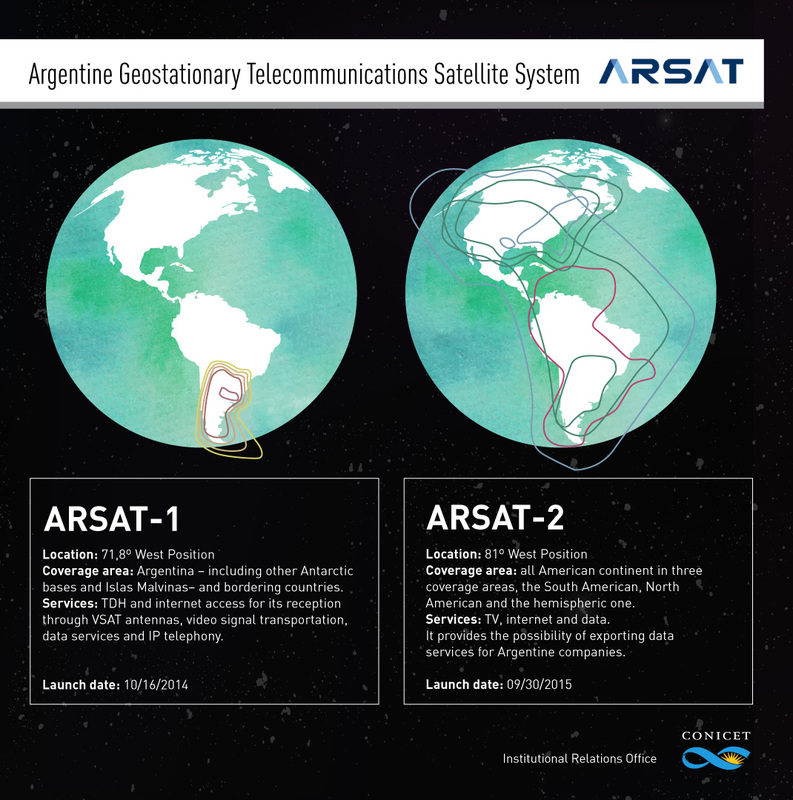 The ARSAT 1 works at a 72⁰ West position of around 36 thousands kilometres, providing services for Argentina and other bordering countries. Besides, this satellite is going to be at 81⁰ West position in that fixed point, enlarging its scope from Canada to Las Malvinas and Antarctica. “It is worth mentioning that thanks to Argentine diplomacy, it was possible to keep those fixed points of 72⁰ and 81⁰ in the sky. When the useful life of the NAHUELSAT 1 ended in 2010, Great Britain aimed to change to those points. However, the International Telecommunication Union decided to give those positions to Argentina”, the researcher comments. This afternoon, when the Ariane rocket lifts off from the French Guiana, it will be carrying the Argentine satellite to be into orbit and it will also place first an Australian telecommunications satellite in the space. Finally, when the ARSAT 2 assumes its position, and spreads its solar panels to charge its battery, it will start operating at full capacity. If everything goes as planned and its mission is accomplished, the ARSAT 2 will provide more and better communication for 15 years. All this sequence will be broadcasted from the Televisión Pública at 5 pm. At the CENPAT, scientists study satellites with applications in both terrestrial and marine and natural resources, “We have a strong bond with the Argentine National Commission for Space Activities (CONAE), which is under the scope of the Planning Ministry and we also use the information from the Italian Space Agency or NASA. In 2016 and 2018, the CONAE is going to launch two SAOCOM satellites to be used in research into environmental emergencies: floods, oil spills, forest fires, among others. This satellite along with other four Italian ones will form the first constellation of satellites applied to this field”, Del Valle concludes. By Diego Nuñez de la Rosa.